The AfPak Madrassa Threat: What Are We to Believe? Islamic religious schools, or “madrassas,” have garnered special attention in recent years because they have proliferated rapidly and are thought to be the cultivators of Islamic religious extremists responsible for terrorist attacks. Steve Coll writes in Ghost Wars that “in 1971 there had been only 900 madrassas in Pakistan, by the summer of 1988 there were about 8,000 official religious schools and an estimated 25,000 unregistered ones.” Others, such as P.W. Singer, have suggested that there may be as many as 45,000 madrassas in the region. Madrassas have also provoked concern in the West because of the narrative being told here. The narrative begins in the 1980’s when the military commander turned President of Pakistan, General Zia-ul-huq, gave madrassas money and land. This support was given in concert with anti-Soviet US aid money and Saudi support that together provided the foundation for the force that eventually vanquished the USSR from Afghanistan. 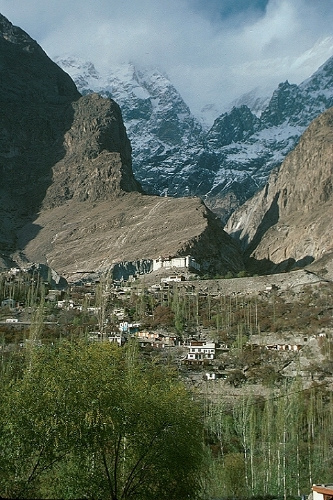 According to the narrative, the Mujahedeen continued to use the madrassas after the Soviets departed. Then, the narrative suggests, madrassas became the best alternative for poor families with limited options. Out of desperation, the story goes, the sons of poor families attend madrassas where they are turned into religious fighters and Islamic extremists. From this point of view, the logical method of fighting extremism is to counter the proliferation of Madrassas by offering scholastic alternatives. Greg Mortenson, a mountain climber turned activist, and the author of the best selling book Three Cups of Tea, has done just that. He founded the Central Asia Institute (CAI), which has built nearly 150 schools in Pakistan and Afghanistan. Mortenson builds schools in the most difficult to reach regions of the two countries – his goal is to illustrate that if an NGO such as the CAI can build schools in the hard to reach parts of AfPak, then others should be able to build them everywhere else. Mortenson also specifically strives to educate girls and young women (girls still only make up just 30% of the total student population in Pakistan). He quotes the African proverb: “If you teach a boy, you educate an individual; but if you teach a girl, you educate a community.” This is critical to battling extremism because, according to Mortenson, “a person who has been manipulated into believing in extremist violence or terrorism often seeks the permission of his mother before he may join a militant jihad – and educated women, as a rule, tend to withhold their blessing for such things.” Mortenson’s assertion is that education will act as a counter to the growth of extreme Islamic militancy. The western narrative that leads to this conclusion, however, is somewhat skewed. To begin with, there may not be as much difference between public school students and madrassa students as it indicates. According to Christine Fair (formerly of the Rand Corporation) a survey of 141 martyrs (based on posthumous family interviews) indicates that the only thing truly remarkable about the profile of extremists is that they generally have more money and more education than average citizens of the region. And, according to the survey, only 4% of the martyrs referred to in the survey had attended a madrassa as a full time student. This suggests that some families who enroll their children in madrassas have other options – and that extremists find their way to militancy by way of various paths. While madrassas may breed fundamentalists who have learned to recite the Koran in Arabic by rote, such schools do not teach the technical or linguistic skills necessary to be an effective terrorist. There is little or no evidence that madrassas produce terrorists capable of attacking the West. This lack of sophistication doesn’t mean that madrassas produce extremists incapable of participating in local or regional fighting, and madrassas promote militancy in other ways – recruiting, for example – but it does indicate that providing alternatives to religious schools as a means to reduce extremism should be just one tactic in a larger strategy. It cannot become the focus of our effort – as Nicholas Kristof suggests – at the expense of a well-rounded approach. Rather, it must be just one part of how we make terrorism unprofitable and unattractive. It would be easy – too easy – if the way to defeat Islamic extremism were simply to build secular schools faster than the enemy could build madrassas. As we have found in the wars of the last decade time and again – our foe is crafty and complex, and we must attempt to understand him without presumption. It is only when we shed our own logic and expectation – and see the fight through his eyes – that we will find successful solutions. Finally, despite what I’ve written here, I believe that Greg Mortenson’s work remains vital. If we truly believe that success in Pakistan and Afghanistan is critical to our national security, then we must recognize that madrassas are not a singular villainous threat, nor are they benign or insignificant. At a minimum they contribute to the narrow worldview that permits and perpetuates extremism. Extremists can only thrive in a society that lacks the organization, resources and the will to oppose them. Raising the general level of education in the AfPak region won’t happen overnight; certainly not by the stated US draw down date of July 2011. But if we have, as I have suggested above, shed our logic and expectation to see the fight through our enemy’s eyes – we will recognize that societal education is critical to many other facets of our effort; state building, institutional capacity, fighting corruption – and that it is these efforts and not our specific tactical victories that will, eventually, bring about the national security we seek. Innovation involves utilizing existing or new technology in previously unknown ways. Assuming this requires both physical technology and the local application of that technology, militaries can be major domestic sources of innovation by possessing local knowledge along with the funding and technology needed for massive R&D efforts; this can best be realized by partnering with large-scale organizations such as universities. Militaries often possess a significant amount of cutting-edge technology in transportation, telecommunications, arms, and other infrastructure. Soldiers are trained to use such technology and often have a high amount of human capital in many fields. Militaries are also uniquely positioned for partnerships with other well-resourced organizations such as multinational organizations and major foreign militaries; this provides an avenue for direct technology transfer and associated high-tech training and support. Further, soldiers operate in risky environments that force them to innovate by using all available means to accomplish their goal when surprises arise, as they often do during battles and training. 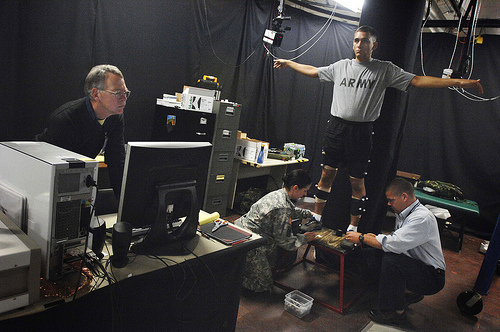 Thus, soldiers experience unique circumstances in new locations while using fairly advanced technology, which demands critical brainstorming to innovate on a regular basis. Militaries often have large amounts of personnel. If they were conducting socioeconomic development activities as outlined in my previous post, or if they had numerous bases around the nation, soldiers will probably be dispersed throughout the country. They have the transportation/mobilization capabilities and the security training to operate virtually anywhere in the country. Further, assuming they are somewhat representative, militaries contain citizens from throughout the countryside with experience from a variety of different local conditions. Therefore, although militaries are a large-scale organization, they tend to possess a significant amount of local knowledge as well. Large-scale organizations, as measured by money available and by ability to possess or work with cutting-edge technology, are a main source of building on existing technology, possessing the scale and the fixed capital necessary. Such large-scale organizations include large firms, think tanks, and universities. This blog will observe universities in particular, but similar ideas are applicable to other large-scale organizations. Universities are some of the biggest sources of innovation due to a steady source of skilled, diverse, and often entrepreneurial manpower (students) to brainstorm and experiment on developing new technologies, knowledge of current cutting-edge technologies and how they work, and much funding available specifically meant for R&D. Local knowledge applies cutting-edge technologies to make them locally useful. Militaries do not have a comparative advantage in focusing many efforts towards R&D—they need to train for security first and foremost. However, militaries can join universities in a mutually beneficial partnership to produce relevant cutting-edge technologies and spread them out to adapt them to specific environments. Militaries can be a large source of R&D funding in universities; for example, the U.S. military is one of the biggest funders of R&D at MIT. Also, although universities already have some level of local knowledge from their diverse student body, it may be beneficial for some soldiers to join in R&D efforts to offer their experiences throughout the country while using the technology in risky environments; this will add to local knowledge and provide ideas for innovation. Further, although students may not able to implement this technology throughout the countryside, militaries often possess the manpower and capabilities to do so in unique ways. To ensure this innovation is utilized in ways that maximize development, rather than keeping it solely for their own benefit, militaries should be encouraged to share this technology with civilians in the countryside and offer them training. One way to achieve this is through a new socioeconomic mandate for the military. Another indirect means of achieving this is by offering incentives for turnover of soldiers into civilians to maximize the amount of civilians with high-tech training. This should be combined with efforts by universities to market and promote the new technology to the private sector. Much of the R&D efforts will be tailored towards technology that may be only useful for the military; for example, it is not clear that innovations in arms, heavy machinery, and other battle-related technology directly contribute to development. However, aspects of these products will likely advance technology in other areas that will only be recognized based on pre-existent local knowledge and a knowledge of current cutting-edge technology in other areas. Certain radar systems in helicopters may be applicable to new innovations in telecommunications in certain locations, for example. Further, if militaries had a socioeconomic mission complementary to their traditional security mission, they will be much more likely to fund R&D that also focuses on socioeconomic-related technology. Competition. As a meritocracy, soldiers compete with one another to increase chances of praise and promotion. This hones one’s need for achievement, and it places soldiers squarely in control of their own destiny, thus emphasizing an internal locus of control. Experience with Risk. Soldiers learn to operate in a risky environment. They gain experience in minimizing foreseeable risks through preparation and training, and they learn how to continue pushing towards an ultimate purpose when risks exist that cannot be overcome in a new and changing environment. 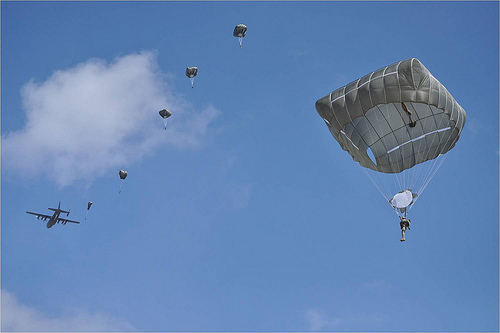 To achieve missions, soldiers learn to innovate by using all available means to accomplish their goal when surprises arise, as they often do during battles. 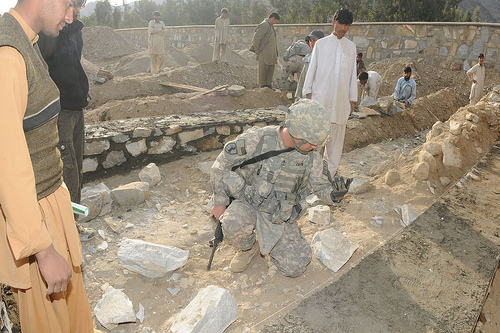 To minimize the amount of surprises, however, soldiers conduct extensive training and planning to have a strategy for success before entering into a battle. They learn as much as possible about the environment, and based on their knowledge they take calculated risks; they minimize risk-taking to ensure safety. Human Capital. All militaries conduct basic training as a means of indoctrination and fast-paced learning. This usually provides soldiers with security-focused skill sets along with discipline, and most militaries force soldiers to complete at least basic education, including literacy programs at the very least. In addition, soldiers are often provided unique opportunities for international education from allies. Further, if military members stay in the service for several years, they experience both implementation and staff roles throughout their career, making them prime candidates for knowledgeable policymakers and social agents who know what it is like ‘out there. Life Skills. The nature of the military provides soldiers with ‘life skills’ that help them function in the world. For example, they learn to work with technology, usually including the internet and email. They also gain experience in handling personal finances with a regular paycheck. In addition, soldiers interact with individuals outside of their local area for idea-sharing and achieving a broader point of view. Finally, soldiers are offered leadership at relatively low levels, where many of them are responsible for subordinates and for carrying out tasks. Rauch and Frese (2000) show that each of these characteristics—need for achievement, internal locus of control, innovation, planning and strategy, low risk-taking, human capital, leadership, and life skills—are directly related to success and entrepreneurship. The risky performance-based environment in which soldiers operate is comparable to the atmosphere an entrepreneur faces, especially in developing countries where risks can be minimized through preparation but the institutional environment is such that risks will always be inherent. On a national scale, policymakers should consider taking advantage of these characteristics through policies that translate them into the civilian realm, such as through a mandated ‘civilian reintegration program’ before a soldier demobilizes. The goal of this program is to tailor their psychological characteristics that were gained in the military towards productive civilian activities. This can be done by identifying and praising the specific success-prone characteristics described above, utilizing a variety of case studies to focus the skills they have gained to the civilian workforce, and providing business training, which could include components of management, accounting, and marketing. Additionally, soldiers’ success-prone characteristics could be indirectly translated through using the military as a training apparatus to educate civilians and other military members. Such policies aimed at increasing the supply of success-prone citizens, when complemented by policies that facilitate identification and financing of these individuals, can lead to a culture of private sector entrepreneurial success and aggregate economic growth. When the earthquake struck Haiti this January, a number of administrations were quick to respond: government organizations, NGOs, IGOs, and foreign militaries. They had a difficult time coordinating efforts, but nonetheless different organizations found ways to contribute, the US Military leading the way in opening sea lanes and airports among other efforts. 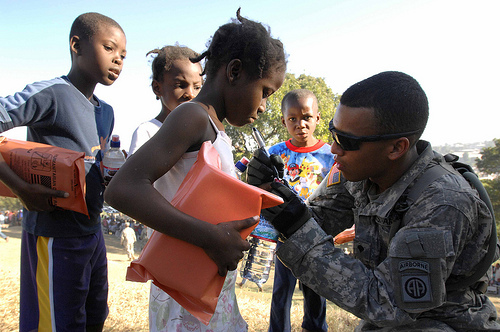 The initial relief effort in Haiti was a product of more global activism and funding than any other disaster relief initiative in human history. And, for some reason, it wasn’t surprising. To me anyway. Thinking back to other recent natural catastrophes, including the 2004 Indian Ocean Tsunami, the 2008 Sichuan Earthquake, and even Katrina, none of them seemed so fully covered by the news, and more importantly none seemed to galvanize support so quickly as this one. Surely the US would have been quicker to mobilize a relief effort to its own citizens in New Orleans than to mobilize a relief effort to a foreign country—be it so close in proximity. Social media served as a first responder, and was the most effective tool at keeping Haiti in the news. Social media drastically increased the global public’s ability to contribute via micro-vounteerism and civic engagement. Social media improved Haitians’ and outsiders’ ability to locate missing persons and repair critical infrastructure. Social media enabled a maturation of global giving through an increase in donation efficiency. Social media enhanced extra-governmental initiatives in assisting ongoing rebuilding efforts. Social media may have changed disaster relief forever. Future natural disaster relief efforts will likely continue to feature similar response initiatives as social media continue to develop and expand, and continue to supply new avenues for relief. Of course, Haiti’s proximity to the US may have actually allowed the social media disaster relief revolution to take place; the US is a nexus for social media, a highly modernized country, and one with a vast collection of relief organizations. Likewise, a similarly monumental social media relief effort would be likely to take place near, say France or Japan, but less likely in sub-Saharan Africa. In this way, social media’s impact on natural disaster relief efforts may continue to increase on average in the future, but will likely be affected by other variables. While social media are certainly able to expedite and improve humanitarian relief efforts, there is a wide range of goals they cannot accomplish. They increased a sense of immediacy in responding to the earthquake in Haiti, but that did not necessarily equate to a substantial impact. Social media may have significantly lowered what would have been a much higher casualty count (in an area characterized by poverty and urban slum sprawl), but we cannot know for certain. More sophisticated coordination among relief organizations likely could have improved relief efforts in ways that technology could not; whether social media can assist in developing this sort of coordination is questionable. Haiti will continue to have problems. Separations in families, destroyed infrastructure, and a lack of security will continue to torment those in the region affected by the earthquake, not to mention that Haiti is Haiti—a country consistently ranked in the 15 worst failed states, poorer than all other nations in the western hemisphere, and continually afflicted by violence including a successful military coup against the ruling power as recent as 2004. What will it take for Haiti to finally recover from the earthquake, let alone the problems that afflicted it before the earthquake, even aside from the hurricanes that barrage it every summer? But the world’s experiences in disaster relief in Haiti will hopefully enable us to be more successful at disaster relief in the future. We learned that social media enable us to respond to disasters more quickly, and sustain response initiatives longer. We learned that social media enable anyone to participate in relief efforts from anywhere in the world. We learned that however important social media are to disaster relief efforts, there are many tasks they cannot accomplish on their own. To be more effective in the future, we much continue to increase our capacity to leverage social media, but more importantly we must find more effective ways to organize relief efforts among government organizations, militaries, IGOs, and NGOs. FEMA was bolstered after our failures in the Katrina effort. Perhaps now the US should build up a new administration—be it through USAID, CIDI, or a version of FEMA—dedicated directly to coordinating natural disaster response initiatives, via some combination of Red Cross, Emergency Management, International Development, and military personnel. This sort of command would hopefully improve interagency coordination and task delegation within the US—though these ideals have never been a strong suit of US bureaucracy. Furthermore, any such initiative would still fall short of addressing the greater question, How can we better coordinate alongside foreign relief efforts? Would the US oblige itself to take the lead on every major disaster initiative? Some say yes; we already do by default. But what about other humanitarian crises, including ethnic conflict, slavery, civil war, and genocide? The 21st Century experiences no shortage of these, and somehow the rest of the world—including the US—continues to function as normal. Social media have a broad capacity to improve natural disaster relief initiatives. Do they have a capacity to improve coordination among civilian organizations and military commands within disaster relief operations? Results so far are unoptimistic. And disaster relief could use the help. Contrary to the New York Times’s Nicholas Kristof’s conclusion that the most development-enhancing thing to be done with militaries is to disband them, domestic militaries actually serve many positive roles for development once good civil-military relations are present. For example, they minimize violent conflict, provide security so that civilians can carry out productive activities, reduce insecurity and instability risks to increase foreign investment, create demand for domestic industries and R&D, and provide discipline and employment to a significant proportion of the population. Each of these military-development connections is inherent in the military’s very existence, regardless of function. However, to hasten socioeconomic development, the missions of militaries can also be modified from a traditional war-fighting focus to a focus on both war-fighting and development-implementing, especially when few external conflict threats exist. Militaries can thus serve as direct development project/program implementers to enhance state service delivery capacity and to modernize the population. In Senegal, for instance, the Senegalese Armed Forces have an ‘Army-Nation’ component that conducts activities in public health care, infrastructure provision, and re-integration for demobilizing soldiers. Each of these is seen as directly contributing to security so that the military operates within its realm, and each clearly impacts the broader development of the country. According to the Gallup World Poll, the Senegalese Armed Forces are indeed the country’s most trusted institution among the populace. 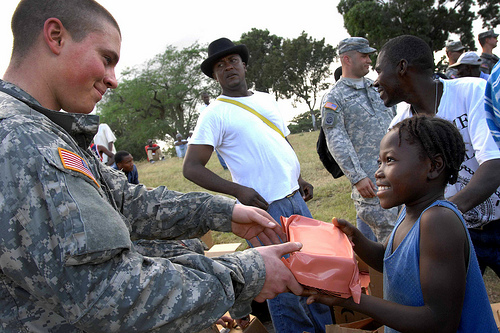 Militaries should be strongly considered for complementing civilian development organizations, both private and public, due to several comparative advantages in state capacity enhancement that most militaries have: (1) culture of expedience and order-taking; (2) vast resource availability for money, manpower, infrastructure, and technology; (3) partnership possibilities for technology transfer and support from international powers and for regional coordination on transnational issues with regional partnerships; (4) human capital in a variety of skill sets since militaries are societies within societies; (5) direct line to the country’s head of state for ease of coordination and funding; and (6) few limits on areas of operation since militaries have security training and weaponry for insecure places along with adequate transportation vehicles for remote locations. Along with these advantages, militaries are significant sources of modernization in the following ways: (1) source of hope and social-climbing for lower classes through a meritocracy; (2) social solidarity effects of forging a national identity; (3) international exposure for soldiers that increases idea-sharing; and (4) source of education and skills-training, especially when military skills relate to the socioeconomic realm so that soldiers find related work after demobilization. However, the importance of strong civil-military relations cannot be overlooked before any of these comparative advantages can be realized, especially considering the coups d’état so prevalent in the recent history of many developing countries. Civil-military relations based in norms of military subordination to civilian authority is the only sustainable means of any policy regarding the military’s function. Especially for this recommended policy that could be considered outside the traditional role and operations of militaries, strong civil-military relations are a prerequisite, with a professionalized armed forces and a civilian leader who respects the military and does not abuse his or her authority by using the military for inappropriate means. Certainly leaders of countries with a history of political involvement of the military will rightfully be wary to utilize the military for anything other than war-fighting. However, with many developing countries still struggling with basic service and infrastructure provision, among a host of other development problems, leaders cannot ignore the vast potential contributions an organization like the military can make. If civil-military relations are properly controlled, militaries can be a domestic source of capital that can catalyze socioeconomic development.